Objectives: Students will review drawing angles of lines, curved lines, and ellipses by using fluid motion of swinging from the shoulder and elbow, proportion & point of view. Analyze angles of objects and the slants of the contour edges by using the sighting techniques. They will learn how to construct a cylinder and use directional lines to draw PVC pipes accurately. They will use a pencil to check proportions and compare proportions of various PVC pipes within the still life composition. Delivery/Demonstration will be intermixed with activity. Review Point of View–How does YOUR point of view affect objects-cylinders & spheres *Show Examples, discuss visible changes. Circles change into ellipses when our point of view of the object changes. If we look directly down at a cylinder, a can, we will see a full circle. 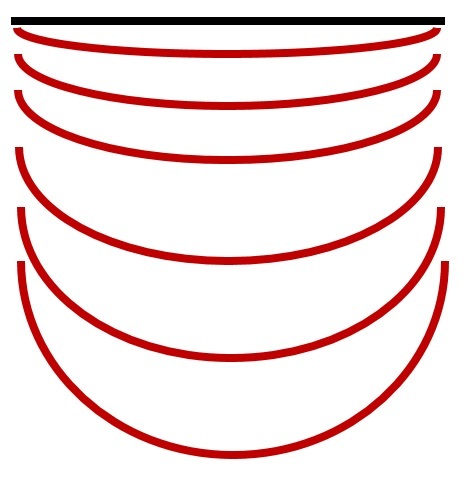 As we lower our position to one side, the opening of the ellipses becomes more and more narrow until we cannot see inside the cylinder any longer. At eye level, the ellipse appears to be a straight line (at eye level). 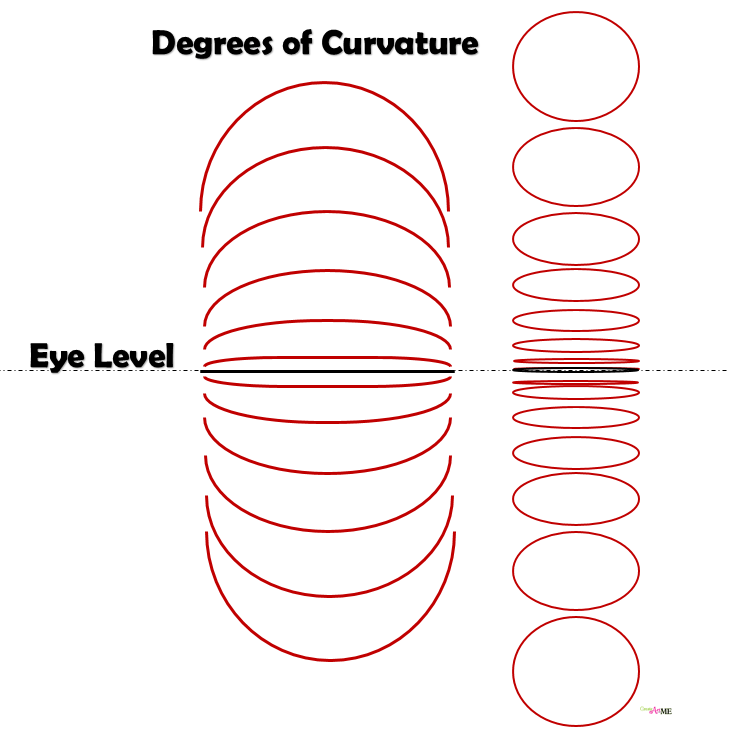 Activity 2: Practice drawing different ellipses of degrees of curvatures (at different eye levels) on your paper. Start with a horizontal line in the middle of the paper then add ellipses above and below the line. The ellipses should show different degrees of “squishiness” -how narrow or wide the ellipses is (my term). They will eventually become a full circle the further they are away from the horizon line (eye-level). 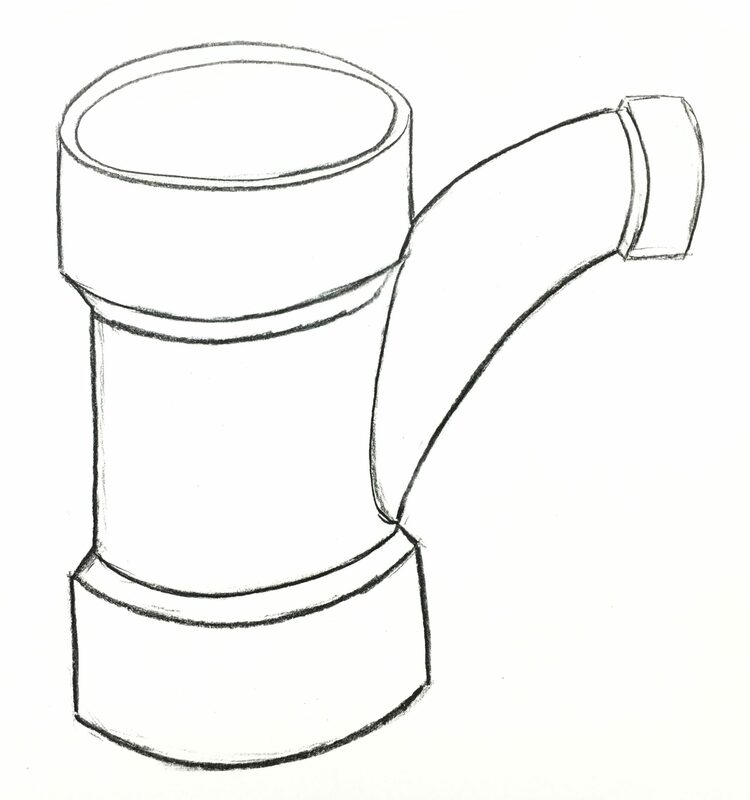 Activity 2: Timed sketches of PVC pipes. 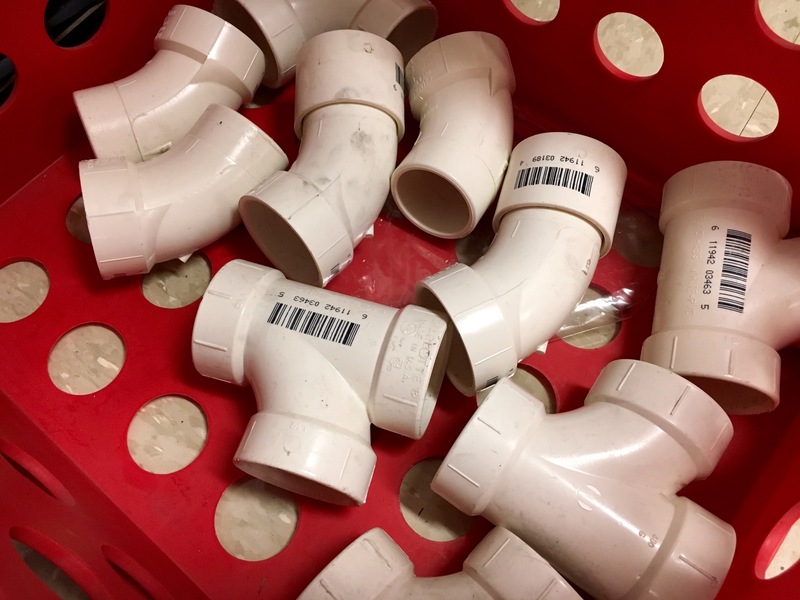 Set up one pipe section per student; make sure to have different styles of pipes and place them from different points of view. Give them 4 minutes to draw the pipes from direct observation. Rotate around to different seats. We also practiced charcoal on a simple PVC pipe drawing I did & copied onto bogus paper. Project Objectives: Create an accurate and interesting composition using 3 PVC pipes (some can be combined to create one form). Render the drawing with full shading exemplifying the 5 Elements of Shading, show hard and soft shadows and lost/found edges. Mid-tones should remain the color of toned paper, use black and white charcoal to render the remaining values. Place 4-6 students in a group. Have them choose 3-7 pieces of PVC pipe to arrange into an interesting composition. Some pieces can be connected to become one piece. The goal is to have three PVC pipes for the final composition. 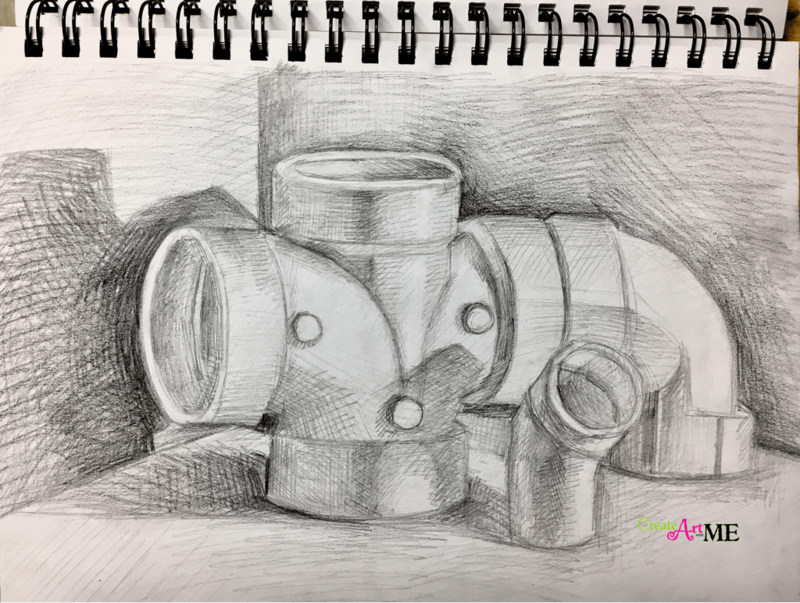 Student light draw the composition of PVC Pipes with drawing pencils first. Place a spot light on the still life. Render the drawing with a FULL rand of values: Drawings should exemplify the 5 Elements of Shading, show hard and soft shadows and lost/found edges. 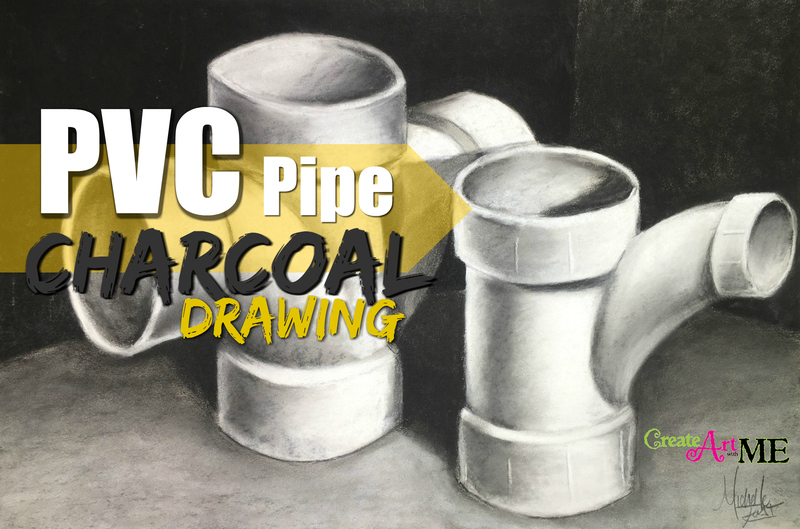 Use black and white charcoal pencils for the PVC pipes (easier to control) and charcoal sticks for the background only.